Breaking news on opioid legislation and immigration issues added urgency and greater purpose to actions taken at the American Nurses Association’s (ANA) 2018 Membership Assembly, held June 22-23 in Washington, DC. The Assembly is composed of representatives from ANA’s constituent and state nurses associations (C/SNAs), the Individual Member Division (IMD), and specialty nursing organizational affiliates (OAs), as well as the ANA Board of Directors. 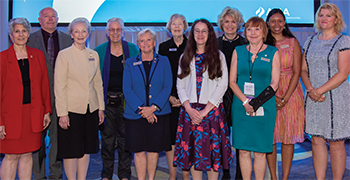 Attendees addressed nurse safety, advocacy, and ethical issues, and eligible voting representatives elected new leaders— including the first man elected president in the association’s history (see page 27). 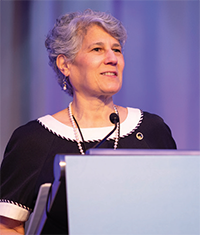 During her opening remarks, ANA President Pamela Cipriano, PhD, RN, NEA-BC, FAAN, reflected on the work of the association during her two terms as president. Cipriano noted ANA’s visibility and leadership during the Ebola crisis. “ANA had to stop misinformation and reduce fear to support nurses and other caregivers,” said Cipriano. The organization’s actions provided a voice of calm and helped healthcare professionals move from crisis mode to resolving problems. ANA also used its voice to advocate for nurses who were making difficult ethical decisions, addressed the growing incidence of workplace violence, pushed for safe staffing measures, and helped amplify the healthcare community’s objections to the current Administration’s attacks on access to quality, affordable healthcare. “Healthcare became a lightning rod issue after the 2016 election,” Cipriano said, leading ANA to devote most of 2017 to fighting against harmful changes to healthcare policy. This hard work in advocacy prompted Forbes magazine to call ANA an increasingly politically powerful lobbying force in Washington, DC, and in state capitals across the country. Cipriano also touched on one of the most unsettling incidents of 2017: The forcible arrest of Alex Wubbels, BSN, RN, a Utah Nurses Association member who refused to allow a blood draw from an unconscious patient. “The bottom line is that violence and harm to nurses should never happen, and nurses should not accept it as part of the job. I’m proud of the #EndNurseAbuse campaign,” Cipriano said. Launched in 2017 to address workplace abuse against nurses, the initiative includes sexual harassment and ANA’s strong support for the #TimesUpNow movement that promotes accountability and consequences for abuse, harassment, sexual assault, and inequality in the workplace. #EndNurseAbuse has garnered 14,000 pledges and is still growing. Additionally, building upon ANA’s zero tolerance policy for workplace violence, ANA convened a panel of experts in May to address barriers to reporting abuse against nurses to foster safe work environments. The 2018 Honorary Award recipients, shown with President Cipriano L-R: Cipriano, Michael Rice, Marilyn Harris, Peggy Chinn, Gale Adcock, Lesley Perry on behalf of M. Louise Fitzpatrick, Valerie Aarne Grossman, Barbara Drew, Paula Anderson, Jacquelyn Taylor, Alexandra Wubbels. Not shown: Joyce Fitzpatrick, Richard Henker. Following Cipriano’s address, ANA presented Honorary Awards to 12 outstanding nurses whose dedication and achievements have contributed significantly to the nursing profession. Two nurses were inducted into ANA’s Hall of Fame: Barbara J. Drew, PhD, MS, RN, ANACalifornia, and the late Marie Louise Fitzpatrick, EdD, RN, FAAN, Pennsylvania State Nurses Association. Ten RNs received Honorary Awards (bit.ly/2muBucd). 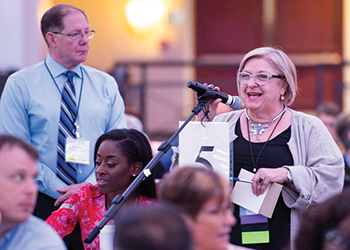 Representatives engaged in dialogue forums on three topics: secondary opioid exposure considerations in caring for patients with overdose, the ANA presidential endorsement process, and the ANA position statement Euthanasia, Assisted Suicide, and Aid in Dying. identify informational tools to inform students and nurses about responding to patients who have potential opioid overdose, and advocate for funding and other support for research and development of evidence-based protocols regarding opioid overdose. refer consideration of the ANA presidential endorsement process back to the ANA board for development of a revised proposal after further input from ANA members and stakeholders. incorporate the following into a revised position statement on aid in dying: Nurses must respect patients’ right to request aid in dying; nurses must be knowledgeable of the law regarding aid in dying in the state or territory in which they practice; while nurses are ethically permitted to participate in aid in dying in states or territories where it is legal, they retain the right to conscientiously object; nurses must be able to provide information on aid in dying and provide emotional support to patients and families who face this decision at the end of life. 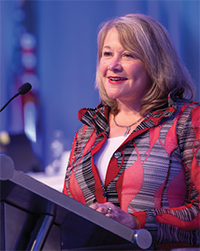 New ANA Enterprise Chief Executive Officer Loressa Cole, DNP, MBA, RN, NEA-BC, FACHE, who began her role May 7, addressed the Assembly, expressing gratitude for the opportunity to lead and remarking on the positive atmosphere. “I am so inspired by the conversations, the networking, inspirational messages, and your leadership,” Cole said. Cole shared leadership lessons she learned throughout her career, specifically in participatory management, quality care, and resilience, and outlined her initial priorities for ANA. Noting that her experience advancing a quality agenda in acute-care settings translates well to her role at ANA, she identified the importance of transparency, doing the right thing, establishing common goals and outcomes, and measuring performance. “We will be transparent, and we will put the interest of America’s nurses first,” she said. On June 22, ANA joined other nursing organizations commending the passage of the SUPPORT for Patients and Communities Act (H.R. 6), which will extend prescribing authority to all advanced practice registered nurses to help combat the opioid crisis. The bill has moved to the Senate. By acclamation, the Assembly endorsed an updated ANA board statement condemning the Administration’s practice of separating children from families at the United States border (Read the statement at bit.ly/2t9x2mK). In a session on June 23, participants engaged in six different policy cafés, a rotating format that allowed for briefings on key issues and opportunities to give feedback. Policy cafés enabled ANA to gather input on topics regarding nursing assistive personnel, licensure evolution, opioids, sexual harassment, promotion and disease prevention, and equipment/safety procedures to prevent transmission of bloodborne diseases. Assembly participants and observers also had the opportunity to participate in ANA’s Political Action Committee (ANA-PAC) and American Nurses Foundation events, and attend lunchtime discussions on a range of topics. The ANA-PAC raised just over $35K, which is $2K more than last year. The Foundation raised $18K, which is 21% more than last year.